The Roman Anglican: The forgotten "Saint". Most people associate the surname “Torquemada” with the most brutal Spanish inquisitor Tomas, unfortunately this awful figure in the history of the church also obscured the name of his uncle who happened to be a most holy man: Juan de Torquemada. He was born in in Valladolid in 1388 and soon joined the Dominican order, and became soon distinguished in both his education and his faith. In 1415 he attended the Council of Constance with his general. Subsequently he attended the University of Paris where he obtained the doctor’s degree in theology in 1423. After teaching in Paris, he became prior of the Dominicans first in Valladolid and then in Toledo. Between 1431 and 1449 he attended the Council of Basel as representative of his order to the King of Castile, where he supported victoriously Pope Eugene IV and the Roman curia as well as the dogma of the Immaculate Conception. He was awarded with the title of Master of the Sacred Palace and with a cardinal’s hat in 1439. He also attended the Council of Florence, where he defended the Papal primacy against the Eastern Orthodox. He also worked on behalf of the Pope in both Germany and again France. As a cardinal he was a strong supporter of the crusades against the Ottoman Turks. ("Crucified Christ with the Virgin, St. John the Evangelist and Cardinal Torquemada" - Fra Angelico - 1440-42 - Tempera on Wood - Fogg Art Museum, Cambridge MA). His good heart begins to shine when he defended the converts of Toledo, former Jews who were accused of not being true Christians, against the accusations of his nephew Tomas. In 1456 he promoted the reformation of his order and of Dominican monasteries, in his later years he continued to support the Pope, became Cardinal of Santa Maria in Trastevere and then Cardinal Bishop of Sabina. He died in Rome in 1468 and was buried in Santa Maria sopra Minerva. ("Annunciation with Cardinal Torquemada" - Antoniazzo Romano - Tempera on Wood - 1485 - Santa Maria sopra Minerva). Santa Maria sopra Minerva played an important role in his life. In this Basilica he founded the Arciconfraternita della SS.Annunziata in order to provide dowries to poor young ladies who could not marry otherwise and would have had to become prostitutes in the better cases. I find this incredibly moving and it is a sign of the charity of the Medieval church, something that modern media don’t seem to enjoy to mention. We must not forget these things. We must not forget that hundreds of hospitals were being created throughout Italy in these very years, by the Church. Some examples are Santo Spirito in Saxia in Rome (which originates in the VII century and was rebuilt in the last XV century by Pope Sixtus IV) and the Spedale degli Innocenti in Florence for the orphans. However, this good Cardinal Torquemada can still be seen in a glorious altarpiece by the Roman Renaissance painter Antoniazzo Romano, the renowned Renaissance Roman artist, near his tomb in Santa Maria sopra Minerva. In fact the last work of this great artist. It represents the Annunciation, in the centre Cardinal Torquemada accompanies the young ladies at the feet of the Virgin, who gives them their dowries, once again the merciful Virgin Mary is taking care of humans as their true Mother, a touching late Medieval/Renaissance concept. 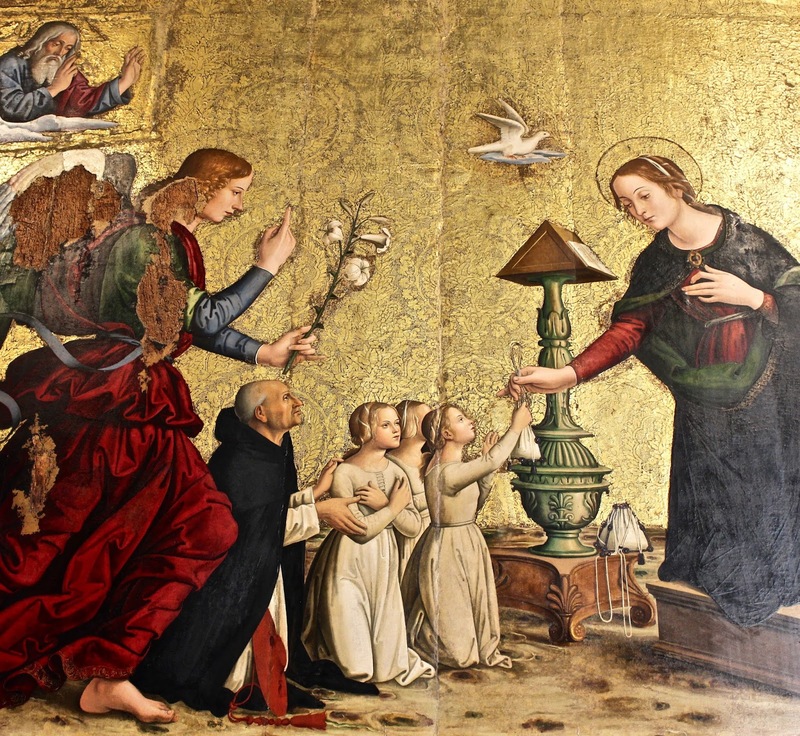 This particular Annunciation stresses the action undertaken by the commissioner, Our Lady appears to be more intent in saving the young ladies, dressed in pure symbolic white dressed, than to pay attention to the Archangel Gabriel. 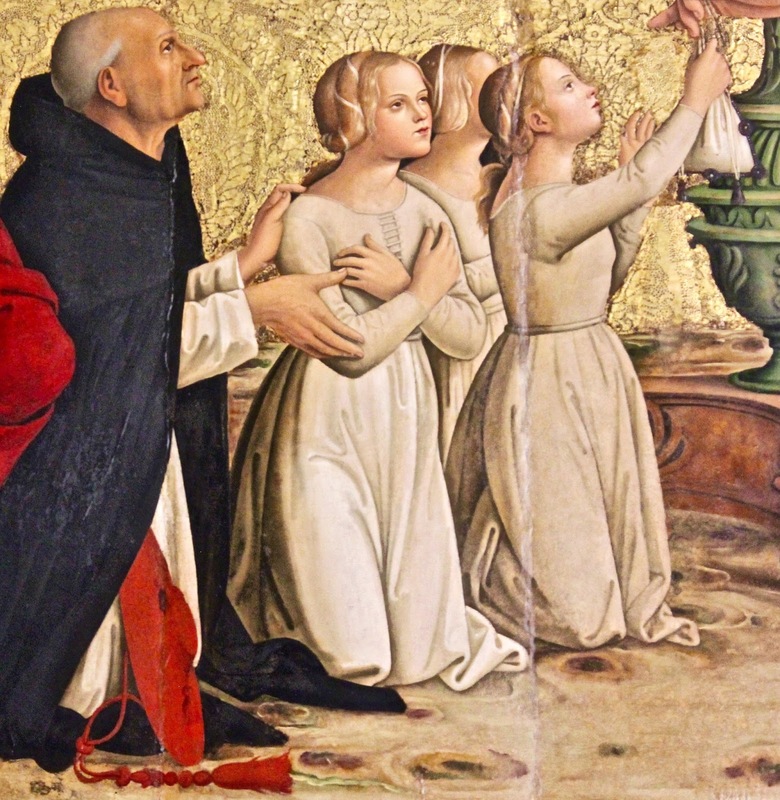 The young ladies are being presented by the Cardinal Torquemada, in his Dominican habit and black cappa (hence they were known in England as "black friars") and with his cardinal hat just popping out of it. The iconography of Antoniazzo is often quite Medieval, the characters have different sizes, dictated by their rank, another old fashioned, Medieval, detail is the gilded brocade in the background, quite popular in International Gothic art (the last phase of the Gothic style, 14th and early 15th centuries), the same can be said about the archangel's wings, whose color dictates his high rank. Instead, the character's smoothness and plasticity derive from influences Antoniazzo received from Umbrian and Florentine masters. Whereas in Rome the Popes commissioned art works from masters from Florence or Umbria, or even to Melozzo da Forlì, who sometimes collaborated with Antoniazzo, he was mostly the artist of convents, cardinals and other local clients - this is just the case and the position of the work stresses the relation between iconography and the commissioner. I find the scene absolutely moving, the Cardinal presenting the young ladies to Our Lady who just in real life, symbolically, donates the dowries to them, in an act of mercy that defines Our Lady in her symbolical form, as the metaphor of the Church founded by Christ, that Virgin of the Annunciation (the actual theme of the painting) through whom the Word became Flesh, and so the Church receives the Spirit to accomplish its mission, the Virgin is also the Queen of Heaven but also that lowly to whom the Renaissance commoner found intercession before the glorious and majestic Trinity, and I believe she still does. Detail of the Cardinal with the young ladies receiving their dowries from the Virgin.